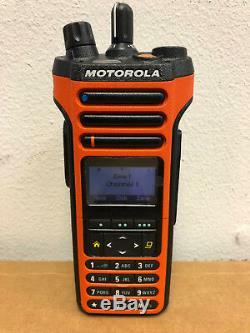 MOTOROLA APX 4000XH Single-Band P25 Portable Radio w/Bluetooth 800/900 mhz. TAGS ARE MATCHING EXCEPT FOR FLASHCODE UPGRADE. LATEST V17 CPS USED AND FIRMWARE LOADED. Moto tamper seal is still intact. Never opened for any reason. Q806 ASTRO IMBE Digital Operation QA04832 PRIMARY BAND: 8/900. Legacy SW System Key Enable. Q361 ASTRO 25 9600 BAUD TRUNKING. 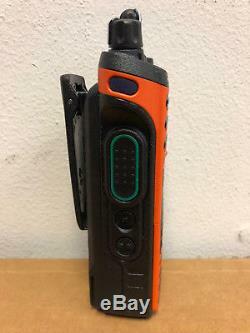 The APX 4000XH leverages the leading attributes of the APX family of P25 TDMA portables like the 2-microphone design built to reduce background noise so you can speak and hear clearly over heavy equipment, diesel engines and drilling activities. Rated with the highest hazardous certification offered on the APX portfolio: CSA -157, IECEx and tested to the US military standard MIL-STD Rated G. The APX 4000XH is built tough inside and out to withstand harsh environments. The skeleton design helps protect the core from shock/impact and submersion. 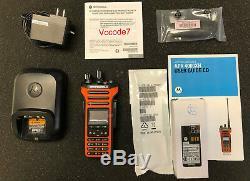 Related accessories are pending HAZloc certification with the APX 4000XH. Extreme Audio Profile Provides the latest noise reduction software for users that frequently encounter loud environments. Integrated GPS Enables accountability and location tracking of an individual, which can be sent to a map-based location application. Optional feature and requires ASTRO 25 Integrated Voice and Data. Intelligent Lighting Uses color to notify you of the radio mode, potential emergencies, or specific events. Color alerts provide information at a glance. Mission Critical Wireless Option available to connect quickly, securely and simply to certified Bluetooth devices. This feature works on P25 Conventional or Trunked systems, providing digital quick call II operation that is identical in operation as the legacy analog version. Encryption Optional FIPS 140-2 Level 3 AES certified hardware encryption provides tamper-proof security to ensure secure communications. Text messaging Offers a freeform or canned messaging solution so you can efficiently and discreetly send and receive messages. Over-the-air programming Motorolas POP25 solution allows portable and mobile radios to be programmed over the air via the ASTRO 25 systems while remaining in the field. 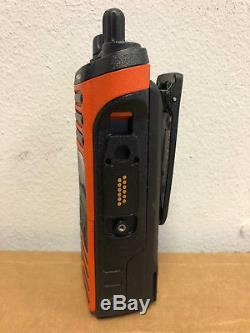 The Man-Down feature allows the APX portable radios to automatically send an Emergency Alarm or Emergency Call when the radio is motionless and horizontal. For the safety and security of Man-Down users, the feature will alert the on-scene supervisor or dispatcher of an emergency event. Ensure fast communication and collaboration across all responders arriving on a scene. Geo Select automatically changes the active talkgroup based on the radios GPS location and the agency-designed geo-fence. 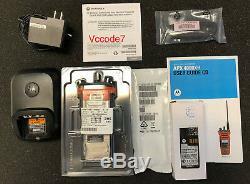 800 (851-870 MHz) 900 (935-940 MHz). 25 kHz, 6.25 kHz, 12.5 kHz. Dimensions H x W x D (without standard battery). 5.86 x 2.60 x 1.39. With multi-unit charger (MUC), With cable. 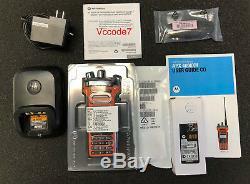 810 G, 810 F, 810 D, 810 D, 810 E, 810 C. The item "Motorola APX4000XH APX 4000XH BT P25 Phase 2 TDMA BRAND NEW" is in sale since Thursday, July 26, 2018. This item is in the category "Business & Industrial\Facility Maintenance & Safety\Surveillance & Alarm Equipment\Two-Way Radios". 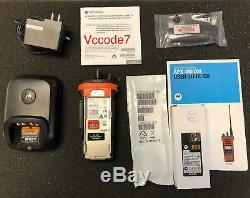 The seller is "vccode7" and is located in Monterey Park, California. This item can be shipped to United States, Canada, United Kingdom, Denmark, Romania, Slovakia, Bulgaria, Czech republic, Finland, Hungary, Latvia, Lithuania, Malta, Estonia, Australia, Greece, Portugal, Cyprus, Slovenia, Japan, Sweden, South Korea, Taiwan, South africa, Thailand, Belgium, France, Hong Kong, Ireland, Netherlands, Poland, Spain, Italy, Germany, Austria, Israel, Mexico, New Zealand, Singapore, Switzerland, Qatar, Croatia, Colombia, Bahamas, Viet nam.